This complete cyclone upgrade kit will turn your Tippmann marker a true machine gun. The upgrade allow your cyclone feed to load faster and put out balls like never before. SKU: RAP4cyclonekit Categories: A-5 Upgrades, Tippmann Loader Parts Brands: RAP4. 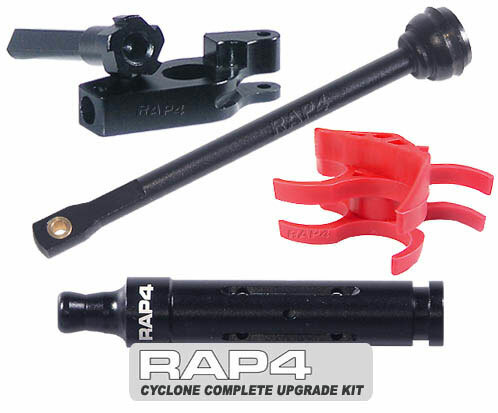 The RAP4 Tippmann Cyclone Feed Metal Upgrade Kit is Teflon coated aluminum internals that replaces the stock plastic internals of the Tippmann Cyclone feed. This upgrade kit provide the higher performing internals for the cyclone feed to allow the loader to keep up with the marker when shooting full auto. The upgrade kit is designed for faster, smoother and more durable parts needed for feeding upward of 30+ balls per second and continue to delivery paintball into the chamber under extreme fast and furious shooting. The RAP4 Tippmann Cyclone Feed Piston Rod is designed with the brass bushing, it is made to increase its performance and durability. The RAP4 Tippmann Cyclone Feed Quick Exhaust Piston Housing is designed to rapidly vent the blast of air to help the loader respond time. This will improve the loader performance by increasing speed and efficiency for more rapid trigger cycling. The RAP4 Tippmann Cyclone Feed Soft Paddle is designed to assist the paintball into the firing chamber with grace. Made to be soft and flexible, the Tippmann Cyclone Feed Soft Paddles keep the ball flowing into the chamber without compromising the paintball shell integrity to prevent breaking, chopping and cutting.